When I remember summer from my Kansas childhood, I remember the glories of hollyhocks. I’m not sure why, except the color in the hot of summer is glory, in itself. It’s taken me a few years to make a Kansas garden here in our backyard of Kansas City. I’ve planted iris that smelled like my childhood grape pop and roses and day lilies, but hollyhocks waited until the right moment (or something). Last year’s hollyhock seed planting has, this year, brought forth booms. 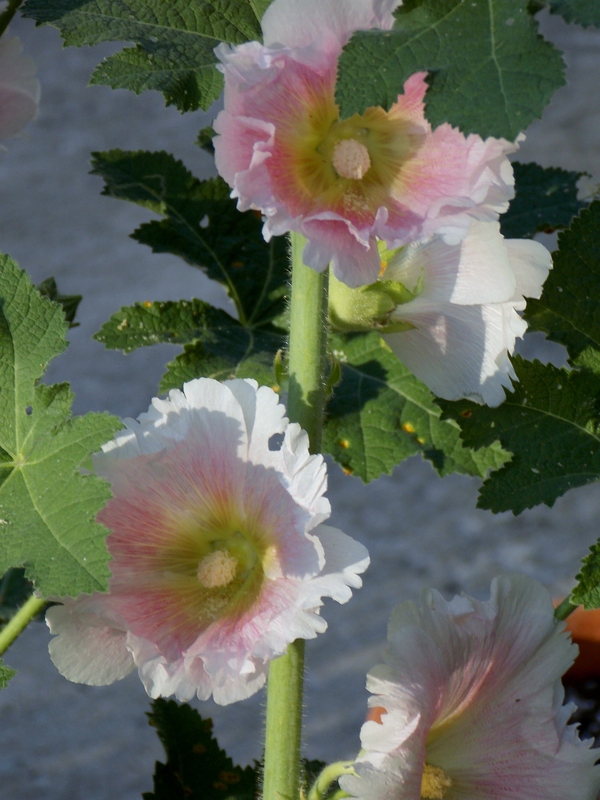 Below are summer hollyhocks, a simple flower, really, but filled with glory and light. My sister, Gail, has wonderful luck with Hollyhocks but I’m one of those immediate gratification gardeners and I haven’t made a place for the seeds to sleep over 12-18 months to get that marvelous show of frilly color. Thanks for reminding me, Janet. I’ll snag some seeds and add to my rain garden for sure now. Does anyone know if Hollyhocks are in the same family as Rose of Sharon/Hibiscus? They so similar in the blooms. Thanks, Valorie. I had to wait too (oh, yes, that favorite thing) and last year they managed a few leaves, but this year they (I have three) are absolutely covered in buds and blooms. That single ferocious stalk standing straight and tall and glorious in bloom is worth the wait. As for the Rose of Sharon, could easily be the same family. The blooms sure look similar. Thanks for stopping to see! You’re welcome! Thanks so much for your remembering them.